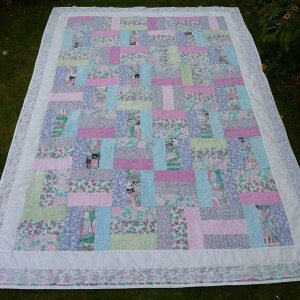 When her mother was no longer able to wear her pretty summer dresses, Moira used them to make a quilt. She added torchon lace made by her mother, a skilled lacemaker. Moira goes on to describe her preference for appliqué and how she usually machine quilts in her individual style using black threads, a technique she teaches in workshops. 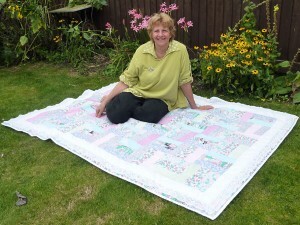 At the age of 63 she has recently won her first prize for a quilt. Elizabeth Ingle [EI]: This is Elizabeth Ingle interviewing Moira Neal, TQ.2016.037. Okay, just to refresh, this is Elizabeth Ingle interviewing Moira Neal, TQ.2016.037. Moira, you’ve just shown me the most beautiful quilt that you made for your mother. I wonder if you could tell me a little more about it. EI: … how you came up with the design? EI: and just through 90 degrees? MN: Yes, ju, yeah. It’s all very pastelly. Her, her summer dresses were sort of pale pinks and blues and greens, m, mauves and so I’ve teamed them up with hand dyed sheeting in similar sort of colours, and that’s how, how I did that, and I sewed it together very, very quickly. It’s a great design to do if you’re in a hurry to get the quilt done. Then I added a white border and then another border beyond that of some more of her dress fabric and then I wadded it up with some polyester cotton wadding and lined it with white sheeting and then after I, I, I sort of pinned it all together to quilt it and then I added lots of memories in the background. EI: So what, what sort of memories have we got? EI: What sort of things did you capture? MN: Uh, all sorts of things. I started from when she was a, a young girl. She was a figure skating champion, so that, she’s, that’s written on here somewhere, that she was a figure skating champion. Her sister was supposed to win the Yarrow Trophy but mum, [laughs], mum won it instead so I think that didn’t go down very well in the family. And then all sorts of other things. I’ve put her, her sister’s names are Ella and Catherine, so I added those names to, to the quilt and then my brother is Dave and he’s with his wife Eve, so they’re on the quilt. She used to love drinking gin and tonic with lots of ice and lemon, so all of that, all of these things are sort of quilted in the background in pastel thread so you can’t really see them but if you look closely at the quilt, you, you, you can see, you know, you can read them. 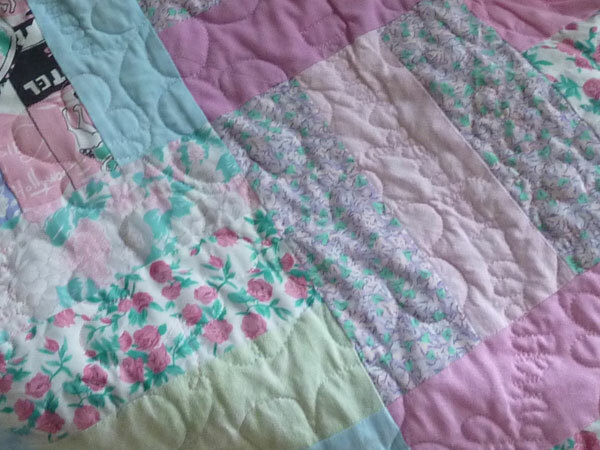 But they don’t detract from the design of the quilt at all. MN: Well, Nanno, uh, my daughter used to call her Granno, and when she had children, her little granddau, her little child, Hope, couldn’t actually say G, so she used to call her Nanno and we decided actually that was rather lovely, so she stayed Nanno, even after Hope could actually say Granno. EI: It’s a lovely memory. EI: And wh, and what about all this lace around the edge? MN: Yeah, well, the lace was made by mum. She was a great torchon lace maker and, and made lace for well over 20 years. She used to, to go to class with Bridget Cook and Geraldine Scott and, and join in sort of the lace making groups and it was very, very prolific. She loved making mileage and I’ve got a whole boxful here of, of lace that she’s made that’s actually not being used and I found the lace for this quilt, it was all rolled up, it was an unused roll of, of lace so I added it to it, you know, so it, it was my crafts mixed with hers, so it was quite fun to, to bring the two together. Yeah. EI: Yes, some, sometimes you just need to get on and get something like this done, don’t you? EI: But it is beautiful. What sort of size is it? MN: Well, it fits a single bed. I don’t know what it actually measures but it fits over the single bed and [EI: Yeah], and it, yeah, does look actually very pretty on there, and when I, when I sort of, I wrapped it up and gave it to her, it was a, it was a lovely moment when she unwrapped it and she, she was so thrilled to be given the quilt and then she realised, she said, ‘Oh, it’s my dresses.’ [EI: Wow] That was, that was really a wonderful moment. Yeah. EI: So she has this with her, in, in the care home? MN: She has now, yes. At the time when I made it, she was living next door. I was her full time carer and, because we, she lives in the extension to our house, or she did do, and she was quite self-caring in the beginning, that’s why she had the catheter on her lower leg, and in fact she still does. She can still empty it herself, so she still continues to wear pretty, trousers and tops and stuff. But this went with her to the care home; and then there’s, there’s here as well. This is a pillow case that I made for her, I think the following Christmas or birthday or something, with more of the scraps… because I’d got quite a few strips of fabric that hadn’t been used. EI: … uh, the Moira I know who quilts with a lot of black thread. EI: Tell me how you… how your quilting style has evolved over, over time. MN: Well, I think it’s probably evolved through laziness, I don’t know. I mean, my own quilting style, pe, it’s very recognisable because I love using black thread. In fact, I’ve just sent off recently for ten cones of 5,000 metres of black thread because I use my, my sewing machine like a pen and I just love, you know, I love pen and wash pictures and the way, as soon as you add a black line you, you delineate things, you know? It just brings things to life and that’s why on this pillow case on here, I’ve appliqued some flowers very crudely in the cotton fabrics again and then outlined them in black, because one of her dresses, one of the fabrics on here has black in it and I felt I could get away with it [laughs] and I wanted to put a bit of me into this as [INTERRUPTION] well. EI: … what sort of age that dress would have been when she would have had that one with the lovely figures on. MN: It could have been in the 1970s or ’80s. The, the, the dresses all came from her trips to Canada and, and the States with her sister and brother in law and for 30 years, from about 1973 I think, they used to send her a ticket and she would go over and spend holidays with them for six, six weeks every year and Howard would always give her a wad of money to spend on, on clothes, loved to see her buying the clothes and modelling them and, you know, she, she thoroughly enjoyed, and so the dresses meant an awful lot to her. This, this pillow as, as well, I want to just show you this part, the, the lace on here. I’ve used some of her old lace here that I’ve taken off her clothes and I’ve dyed to match the fabrics that I’ve actually appliqued onto it. When she had, everything she made was covered in lace – curtains, clothing, napkins, everything – and when things, when she threw things out, I always grabbed them from her and ripped the lace off [EI: Yes] to upcycle it and reuse it. I mean, she’d be horrified, you know, she was a real purist and when she made her lace it was always white, ecru or black. You know, she would never do anything trendy with it, so, but I, I think she, she approves of this, the way I’ve done this. EI: I’m sure she does. I’m sure she does. MN: No, that’s interesting, yes. EI: But she didn’t, she didn’t do that. MN: She didn’t, no, but, but what she had to do in the end as she got older, when she was in her 80s her wrists started causing her quite a lot of problems and if she, we, if she wasn’t careful her wrist would flare up and she’d have to have lots of drugs to sort it out, so she used to set the timer for 15 minutes a day in the end and that was all she could do [EI: Oh right]. But, no, she moved, onto watching. She always used to read a lot, she loved A, Agatha Christies and she had every [stammers] Agatha Christie book going and read endlessly and loved all those sort of programmes on TV like Countdown, University Challenge, Eggheads, that sort of thing, so she did that instead, I think, and went walking. She could still enjoy cycling and, and starting to use the bus and things like that. So she didn’t do any crafts after this, no. EI: Right. But I’m sure she treasures this quilt. MN: Mmm. Mmm, she does. EI: I saw that, yeah. MN: … [laughs] the jelly babies are written on there. [EI: I saw…] [laughter] Oh, here, this is quite fun, actually. With all the wrappers, ’cause she kept all the wrappers, I made her this jelly baby apron and jelly baby bunting for her 90th birthday [EI: Oh wow] so jelly babies are [EI: yes, yes] actually on the, on the quilt as well, so I think it’s, it’s just a fun way of, of getting memories together. EI: It is. I think it’s very important to gather them together. So what are the memories going to be for your family with your, I always think of you as cats, dogs and cats. MN: Oh, cats, yes, and dogs this year, of course, with my on the beach thing. Yes. What will their memories be of me? My goodness, I, I don’t know [laughs]. Madness. We’ve done a lot of mad things together, my grandchildren. We’ve had lots of little dinner parties and stuff and they, you know, they’ll, they’ll remember I think, mmm. We’ve played a lot, we’ve done leaf hammering, we’ve done every craft known to woman, I think [laughs]. Leaf hammering and plaiting and, you know, I taught them to weave and everything. We could, they used to come for breakfast club when they were little and, in that hour before they went to school, if we ate breakfast quickly we could bake a chocolate cake and decorate it before they even went to school so [EI: Oh goodness] that would be [laughs] the sort of memories they’ll have, I think, of me. EI: Yes. So when I look at your more modern work or the, the ones that I know since I’ve known you your techniques are quite different to the traditional quilter. MN: Yes, they are. Basically, I’m not very good and I go to quilt shows and I see these beautiful precise work but I can’t do it. I was one of those clumsy left handers who never got a gold star at school for writing, and I’ve just developed my own quirky style of two wonky black lines, because if you do one wonky black line it looks like you can’t do it, but as soon as you put two wonky blank lines together it looks lively, and that’s how I teach, and people, well, they obviously like the cards I do. I’ve got over 100 greetings cards, that’s all modelled on that, that look, and it’s doable. Anyone can do this [EI: Hmmm] whereas we can’t all do the perfection, you know? MN: Yes, the points, yeah, and I don’t do piecing. There’s none of my work is pieced, it’s all appliqued. EI: And no, no hand quilting or [inaudible]. EI: Yes, which, um, was it third place at Festival of Quilts? MN: Yes. I was so thrilled with that. EI: …in a new direction. MN: Do, yes, and what I’m really loving now, you can see that on that one I painted the background with a, I just started off with white cotton sheets ’cause that forms the basis of all my work and then I painted it and then I’ve appliqued it. EI: So did you have the whole, for this, this work that you do now, do you, do you have the design in your head when you start? EI: So, so it’s just… I mean, it’s art, isn’t it? MN: Yeah, it’s good fun, yeah. EI: I mean, now you’re quilting. Yes. EI: You certainly do. You certainly do. EI: So do you, you have a studio in the house? EI: So… and you teach. MN: I teach there, yeah, I teach up to four people. I don’t teach very often because I’ve been concentrating this year on writing a book and doing [EI: Hmm] this quilt, but I will teach in the winter again, yeah. EI: So what, what’s the pleasure for teaching? Is it getting over everyone’s inhibitions? MN: It’s the chi, do you know, yeah, it’s interesting, I, I just want to teach everyone to have fun and enjoy creating their own art and people come in and say, ‘I’m not gonna be able to do this,’ and at the end of the day the pleasure in seeing people walking out with something beautiful that they’ve made, and they can do, and the realisation that your work doesn’t have to be perfect and if you just stand back from it, it looks so much better anyway. You know, if you look closely at, at, at the work, it, it doesn’t, it never looks as good, but it’s not about that. Think about a cushion lying on a sofa. You walk into a room and it’s, you know, just seeing it from across the room [EI: Hmm] people say, ‘Oh, isn’t that pretty?’ [EI: Yes, the colour and…]. Yeah, it’s, so it’s about, yes, and I recognise that everyone has their own colour palette and not everyone would like the colours I work in. You have to be true to, to what you [EI: Hmm] enjoy doing and work in the way you like doing. I like raw edge applique and, you know, wonky lines but, you know, some people might prefer to use a buttonhole stitch or a zigzag or whatever. Some people can’t stand the raw edges. MN: I, I don’t mind. EI: …with a knife or scissors? MN: …everything is cut freehand with scissors. I never use a rotary cutter and all the writing, you see, because I was left handed, when I was a child I remember writing backwards. Well, that’s jolly handy when you’re writing on the back of Bondaweb, so I can write very fast on the back of, everything backwards on Bondaweb, so on, on there the words ‘bone idle’ on that dog there, that was all written backwards on, on the back of the paper side of the Bondaweb and then ironed onto fabric and cut out. Then, of course, it comes out the ri, the, the right way round. [EI: The right way.] But none of the letters are, nothing is perfect. It’s all just hand drawn. EI: … and we have an awful lot of fairly traditional quilters. MN: Yes we do [laughs]. EI: … so, and a lot of our meetings are quite traditional techniques. How do you find those? Do you find that, does that shed any light on [talking over each other]? MN: Yeah, it’s fascinating, you know, because you’re always picking up ideas and, and, and recently I had the pleasure of hosting Pauline Barnes at, she came to Cambridge Quilters on the Friday morning all the way from Sutton Coldfield and she gave us the most incredible lecture that morning, and then I helped her, you know, pack all the quilts up and brought her back here and we chatted all afternoon and she stayed for the evening and then was teaching at a workshop the next day, and do you know I, we, she was talking about all the quilts that had won prizes over the last 20 years and so I just asked her the question how old was she when she first won a prize, because I was actually quite interested to know how old she is, and she said she was 59. Do you know, she’s going to be 80 in November? [EI: Hmm, she is amazing] And she is the most extraordinary person. 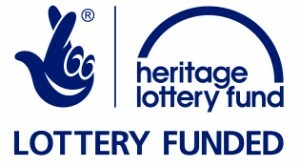 She was a true inspiration to me, and the fact that she only started to win, you know, at exhibiting in, when she was 59, I’m 63 and a half and just have won this, this year and it’s really inspired me to carry on [EI: Yes] and she, she’s told me to put my cat quilt into the ne, another exhibition, you know? It’s lovely talking to her, so you do get inspired by it. EI: … had great fun trying out and creating all sorts of [inaudible]. MN: I, yes, I couldn’t actually go to her workshop the next day but I did, I drove her there and I, well, I led her there and I bought some of the twin needles from her and, in fact, a triple needle and I intend to use that on my next year’s quilt, my next entry for the NEC next year. I’m going to do something with twin needling before I apply it, but I’m going to do it in my wonky way, [EI: Yes], my style. So whatever I do, ’cause I, I have got a very distinctive style now, I don’t want to lose my style, but it is fun to bring in new ideas into it. So I’m determined to have a go with a twin needle. MN: Yeah, so it keep, you can learn from everybody, yes [EI: Yes] you know? Keep on learning, yeah. 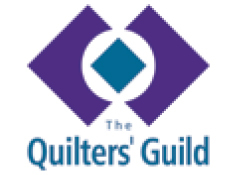 EI: And quilters are generous with their… sharing ideas. MN: Very generous, yes. It’s, yes they are, and with their fabrics and, yes, if you’re away with quilters, somebody’s always got what you want or [EI: Hmm], you know, it’s, it’s fun to share things [EI: It is] and ideas with other people, yeah. EI: Thank you very much, Moira. That’s really been fascinating. Thank you. MN: Thank you very much indeed. Thank you, Liz.